Diabetes food managment ~ The Reluctant P.O.W. Have you seen or read the Diabetes guidelines most often published? If so, you have read that most are recommending a high carbohydrate and low fat diet for Diabetics. This is not in your best interest. Breads contain starches. There are also starchy vegetables such as potatoes. Starch is sugars held together by a chemical bond and as soon as it touches your tongue they start to separate and flood your blood stream with sugars. The better approach is just the opposite. High fat and no carbohydrates, or as low as you can go. This was the traditional way diabetes was treated before about 1935 and the advent of injectable Insulin. 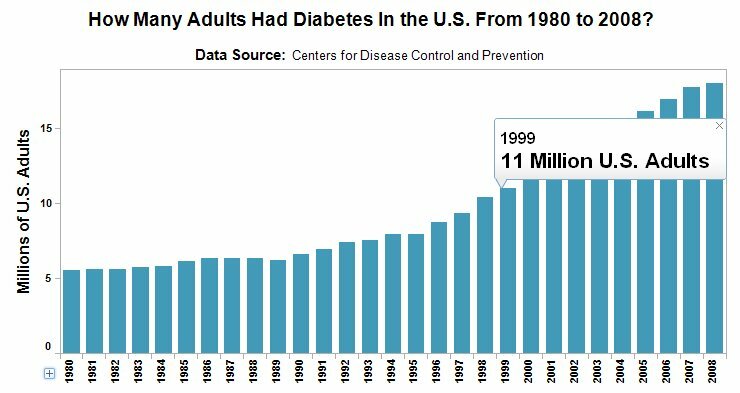 By the 1940's insulin use was on the raise and low carbohydrate diets were falling out of favor. Starchy carbohydrates should not exceed 30% of your diet, 10% or less would be ideal. Results could be dramatic with full or partial reversals in a few months or weeks. 1940 - The American Diabetes Association is formed. 1966 - The first mass produced french fries are sold. 1984 - Soda manufacturers start using High Fructose Corn Syrup. 1992 - The USDA places bread and grains at the base of the food pyramid. 1995 - Metformin is approved for use in the USA. Use your head and check out the research. If you are eating table sugar or eating a compound that is primarily sugars, guess what? Your blood sugar levels will spike. You might be curious about what is causing or what happened to create the upward trend represented by the charts. The charts show the same progression of two events in the American diet. The steady rise in the number of calories Americans consume and the increasing number of overweight or obese Americans. Studies in 2008 indicate that 72% of men and 67% of women are overweight or obese in America. This resulted in the USDA issuing out new guidelines RDA's and diet in 2010 (released in June 2011, bet you missed it). What you might miss reading is the footnotes. The recommended amounts are from various studies done as far back as 1997. Only a small portion of nutrients are reviewed and adjusted each 5 years or as the government puts it "if necessary." There has also been an explosion of sugar in our diets in all types of foods and beverages. In fact, between 1987 and 1997, consumption of "added sugar" in the United States grew 20%. This trend is also being seen in the developing world, according to WHO (World Health Organization). That's one reason both the United Nations and the World Health Organization released guidelines in 2003 that say sugar should account for no more than 10% of daily calories. In a 2,000-calorie-a-day diet, that's just 200 calories -- or eight heaping teaspoons of table sugar at 25 calories each. A single can of regular soda, with the equivalent of 10 teaspoons, would put you over their recommendation. What are chances of getting sick? Let's see . . . for 2008-2010 . . ..
Do yourself a favor and do some old school research, eat less, change your diet and if needed lose some weight.